After a few relaxing days in Salt Lake City attending OnStage Live, an annual Stampin’ Up fun fest that includes special demonstrations, new product make-n-takes, and the Shelli & Sara show that is open only to demonstrators, I hit the ground running back at home Monday morning. We are gearing up for the Christmas shopping season at my part-time gig (Yankee Candle) and collection Operation Christmas Child Shoeboxes at my full-time job. Toss Stamp Campo on Thursday and a small Vendor event on Saturday and it’s no wonder I was in my craft room until 1pm last night…. My crazy hectic life leaves little time for my passion.. STAMPIN’. 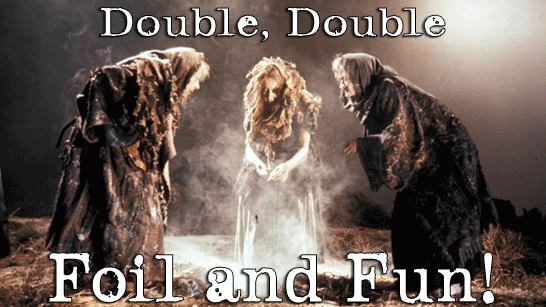 Needless to say, I had finished my Foil creations at 8:45pm last night for the Hop that went live at 9pm. So, the photos weren’t great and I had some issues with uploading good photos. Since I promised to post the projects I didn’t get on the hop… here they are! 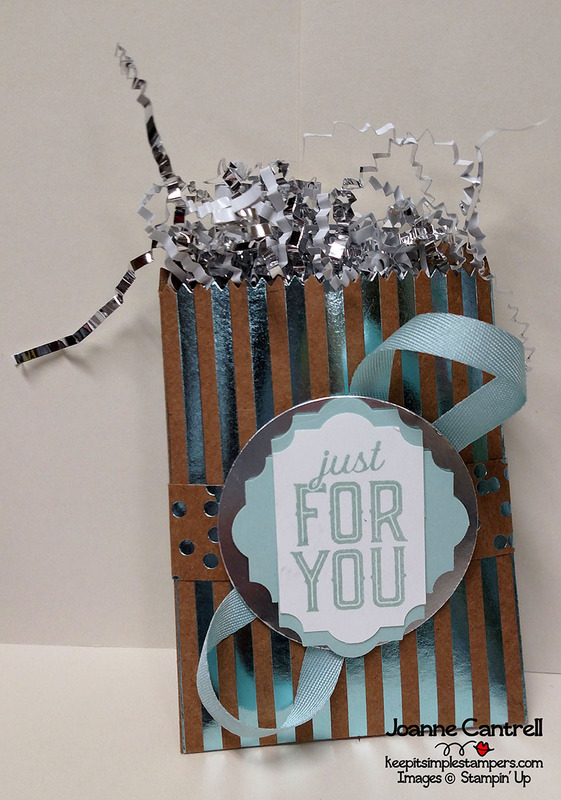 This fun little treat bag was created using the Mini Gift Bag Thinlits (#137547). I added a 2″ circle of Silver Foil and some labels punched from Soft Sky along with some Soft Sky ribbon. The sentiment is for the Merry Little Labels Stamp Set in the 2017 Holiday Catalog. And – SPOILER ALERT – that shredded foil is actually a new product that will be available in the 2018 Occasions Catalog! 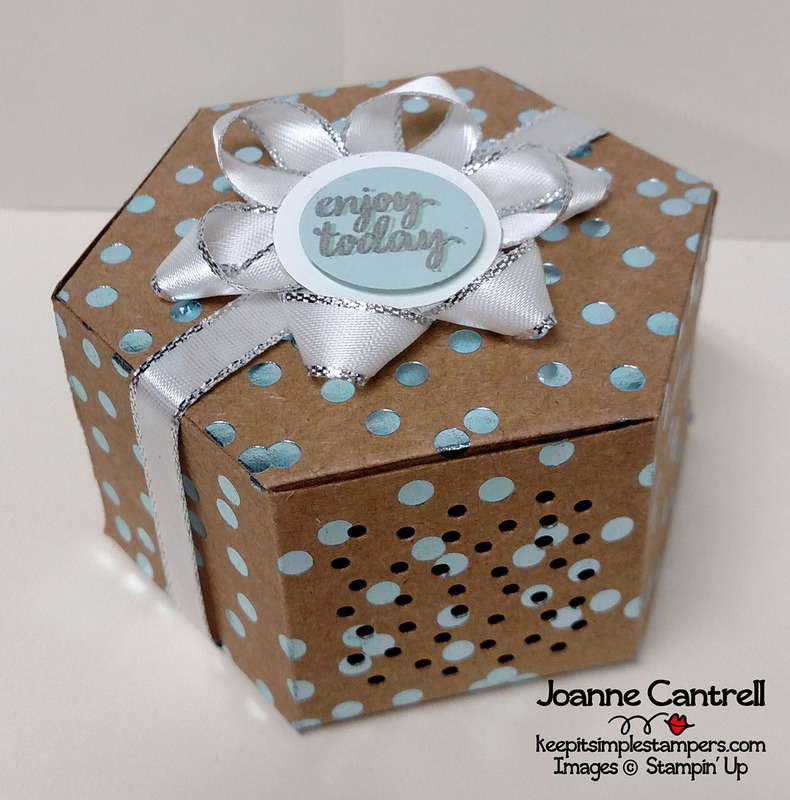 Plain and simple… that’s what this cute little gift box is. I used the Window Box Thinlits (#142762) to make the box. This Foil Frenzy DSP is really great for packaging because it is a little thicker than your normal DSP. The sentiment came from the Eastern Beauty stamp set. It nestled beautifully into the center of the bow. First, I wrapped ribbon around the box and secured it to itself using a couple glue dots… that way you can slide it off. Then, I created six loops from the ribbon. It was maybe cut 2″ or so… folded like a cancer ribbon and held together with a glue dot. Next, I punched a small circle… I think it was like 1″ but can’t remember off hand. I covered that with Fast Fuse. I then attached the loops to the circle. One tip I will add… See the white circle in the bow… that is the circle that I adhered the loops too… It is just turned over. I thought it looked better than the other side. So, I punched a smaller circle of Soft Sky to draw in your attention. Did it work? And, I will just add that it is not a blurry photo! The sentiment was stamped in Soft Sky, then I decided to do it in silver embossing, so I stamped it so that the Soft Sky would be like a shadow! So, if you have made it this far… I have another little treat for you! A bonus project made with some of the scraps! This is a teeny tiny 2″ x 2″ tag made using the scrap cut from the Box Card. The sentiment comes from the Eastern Beauty set – since it was sitting out. And, you can’t tell, but those smaller circles are in silver… and they really aren’t full circles. They were cut form a scrap and are maybe half circles or less. This would be perfect to add to someone’s little thank you gift. 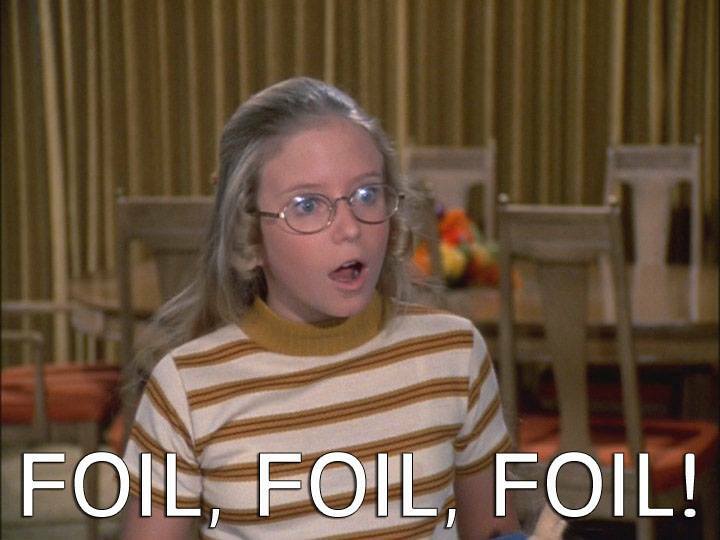 And, there you have it… all my super secret Foil Frenzy projects that I couldn’t post yesterday. If you missed the other projects… Click the link below!